At Crystalaire nearly everyday is flyable. Tucked against the north side of the San Gabriel mountains the best year round soaring in the U.S. is found here. A 45 minute instructional flight, plus ground school prior to the flight. Plan on at least one hour total time. We use an online scheduling system provided by "Schedule Pointe" to make it easy and convenient for our students and pilots to schedule instructor and glider times for lessons. If this is your first lesson (or if you are a ride customer) please call the office or e-mail office@soaringacademy.org to schedule your first appointment and receive instructions pertaining to our schedule parameters. PLEASE contact us PRIOR to signing up for an account. Thank You. To use The ONLINE service you must first register. Before registering, view our YouTube Videos for instructions on how to register and use the Schedule Pointe system. Once you view the videos, please click the 'REGISTER' link below and register using the secure form. If you have questions about the service, please contact our office. Pilots who know agree that early glider training is the best way to begin any serious flying career, but the main reason to come soaring is for the always safe, and frequently amazing FUN . There are no age limits as to when you can begin training to become a glider pilot. However, students will not be able to fly solo until they are at least 14 years old. For power pilots, glider training greatly enhances stick-&-rudder skills, as well as understanding of atmospheric dynamics. (But it's not about the rating, it's about the FUN). A minimum of 3 training flights in preparation for the practical exam. Time to solo is approximately 10-20 flights. No written exam is required of Glider Add-On Rating. Soaring Academy recently acquired two factory new Schleicher ASK-21 gliders, each fitted with adaptive hand controls and high tech instrumentation. 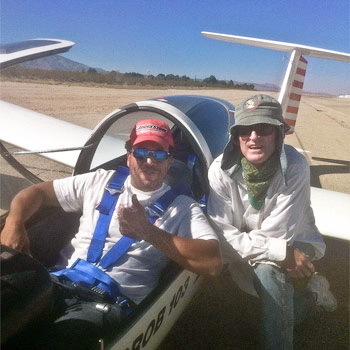 These exciting new gliders allowed Soaring Academy's first paraplegic pilot to fly solo. With the adaptive controls installed, the rudder is actuated by an additional lever on the left side of the cockpit. This allows full control of the glider. Emergency training, weather and mountain flying, going cross-country without need for power, pure aerobatics, and even MORE FUN. Learning does not stop when you get your license. 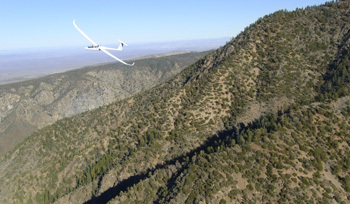 Most glider pilots aspire to cross-country soaring, where long distances are covered by repeatedly climbing then gliding. We can help you attain this goal with dual training in our high performance DG-505. You will learn the finer points of maximizing speed around a course, using all available lift sources, and navigating in unfamiliar territory, all the while under the guidance of an experienced cross-country instructor. Pilots who take a few cross-country lessons with an instructor progress much faster in their cross-country flying. The experience you gain will be invaluable when you start flying for FAI badges, and in contests. Soaring Academy will familiarize you with the complex yet rewarding activity of mountain flying. Our airport is located only a short tow from the north side of the towering San Gabriel Mountains. Lift such as strong thermals, ridge lift, convergence, wave and bow wave are found here year round, some during the same flight. 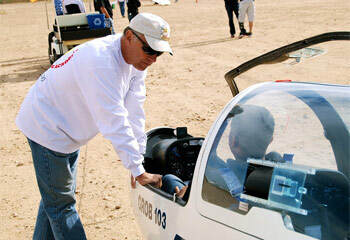 If you are from out of state and want to learn more about mountain soaring then come visit us for a weekend. The neighboring country club has lodges available for a reasonable price. Call or e-mail us for more details. When you fly solo while renting our gliders or act as pilot in command you must have a current renters insurance policy with a minimum of $20,000 hull coverage--inquire with office for the DG-505 hull coverage. If you do not have renters insurance an instructor will be required to fly as your safety pilot at the reduced instructor rate of $48/hour. Training is divided into two parts; knowledge and flight. Knowledge includes aerodynamics, weather, regulations and airspace. Flight includes takeoff, flying the aerotow, maneuvers, soaring and landing. "Student pilots enjoy training in gliders because it teaches the fundamentals of flight with unparalleled clarity." A flight training session with an instructor is typically scheduled for a minimum of two hours. Your instructor will assign you reading and review questions from the textbooks, and will review the material with you before your flights. You will then practice the maneuvers that you have studied. At the end of your flights, your instructor will review the lessons, and assign you material to complete before your next session. This training is mostly self-study, with you reading the FAA Glider Flying Handbook on your own. Your instructor will then answer questions you may have and resolve issues. Any required tests will also be reviewed by your instructor and any misunderstood content will be reviewed to confirm that you understand the material. We maintain a "flight simulator" that can be used to practice some maneuvers. The cost of the simulator is only $10 per hour. The price of each lesson varies based on the glider used, time in the air, time with instructor and tow altitude.